Just a glance at the recent victory Khabib Nurmagomedov won over Conor McGregor clearly demonstrates the importance of wrestling for MMA. With wrestling, you don’t just get techniques – you also get the mentality. And there’s no grappling martial art out there that’s more aggressive and relentless than wrestling. To make it as simple as possible, wrestling is a great addition to any martial art. And that includes Brazilian Jiu-Jitsu. However, wrestling for BJJ goes much deeper than just single and double leg takedowns. There are a lot of things BJJ athletes can take from wrestling, form positioning to the never-back-down mentality. One great example of something that works perfectly for BJJ is the wrestling cradle. Catching someone in a cradle is nothing special for wrestlers. They’re doing it a lot and not paying too much attention to it. The reason for this is that it is a move that ties other moves together, like takedowns and pins. The cradle in itself is rarely a match-winning move in wrestling. However, applying the wrestling cradle to Brazilian Jiu-Jitsu offers much more possibilities. In an art where you have a lot of time to work on the ground, not to mention submissions, having complete control over someone’s upper and lower body is a dream come true. 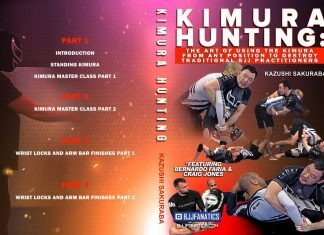 If you like to explore the art of catch wrestling further, especially in a BJJ context, then one DVD set is all you need. Veteran grappler Neil Melanson has a DVD series named ‘The Catch Wrestling Formula” that covers everything you need to know about wrestling for BJJ. there’s a whole DVD in there dedicated to how you can modify the wrestling cradle as well. For those of you that have no idea what the wrestling cradle is, think about it this way. you take an opponent’s foot and put it all the way up to their head. Then, you wrap a headlock, including the leg in the loop. Finally, you put pressure on before you decide where to transition to next. On top of everything else, there are a few wrestling cradle positions, offering a lot of variety. Let’s look at two main version of the wrestling cradle. The first one is the near side cradle, where you find yourself in front of your opponent. while they’re lying on their side. imagine that an opponent turns towards you from bottom side control. That’s your starting point. From there, the aim is to place one arm around the head of the opponent, like you’re attacking a guillotine. Instead of going for a chin strap, the aim is to connect the arm to your other arm, which goes over the opponent’s top side leg at knee level. The grip that connects both hands is an S-grip. Sprawl back and enjoy your opponent’s misery. The second version is the far side cradle. To put it into perspective, imagine that the opponent is now turning away from you from bottom side control. WHiel this offers an avenue to the back, it is also one of the most anticipated transitions in Jiu-Jitsu. However, only a few might be expecting a cradle instead. here, the arm goes under the head in a classic style, just like with a back take. The other arm goes over the top leg again and they both meet in front of the opponent’s neck. This time, however, it is much more effective to grab a ball-in-socket grip instead of an S-grip. The wrestling cradle offers to BJJ a very multidimensional appraoch. For one, it can be used from the top, to make takedowns much easier. It works great from any version of the standing front headlock, as well as many single leg attacks. Conversely, you can attack the cradle any time you find yourself in a kneeling front headlock as well. The cradle is also perfect for hunting for the back. Whenever you’re up against a turtled opponent, the easiest thing you can get is the wrestling cradle. Whether an opponent tries to turn toward you or away from you, you have a cradle ready to go. Even if they remain a Judo style turtle, blocking everything, you can set up a cradle. All it takes is pressuring the opponent to one side so that you get a push-back reaction. The best use of the wrestling cradle for submission grappling, though, is the half guard. Whenever you find yourself in an opponent’s half guard, the cradle is right there for the taking. Simply control the top leg and go for the head. From the cradle, you can then go into pressure passing directly to mount or the back. Alternatively, you can look to finish in one of many ways you have available. The beautiful thing about the near and far side cradle positions is that they’re easily interchangeable. You can go from one to the other at will, always keeping the opponent under constant pressure. The “grave” position is the worst possible thing you can do to someone from the cradle. IT comes courtesy of a grappler by the name of Mike Tavares. You can find his complete instructional at the end of this article. As a big fan of the wrestling cradle,e I scoured the Internet for material. After discovering Mike’s instructional, my submission rate from the position skyrocketed like never before. In terms of positioning, getting to the Grave is done via the far side cradle. From the basic far side wrestling cradle, you use your grip to place the arms in the opponent’s bottom side armpit. This allows you to open their arm towards their head, and insert your near side leg inside. Do the same with your other leg while you’re switching to a seated position. YOu’ll end up with both your legs on the far side of the opponent. where you need to cross the leg that’s near their head on top of the other leg. This offers both great control and a perfect attacking position. Once in position, you have a multitude of attacks open for you. You can go for armlock attacks on both the near and far side arm. the near side arm is better for straight armlocks, with bent armlocks working for the far side arm. The choke is as simple as it gets – slams your knuckles into the near side of the neck, and pull the opposite side of their head towards the arm. Finally, you can hit anything, from heel hooks, through toe holds to Estima locks on the near side leg, without any risk fo the opponent countering.